From past experiences, it would seem Ice is not interested in killing his half brother, but rather ruining what he holds important, in such the cat tries to drag him into many bad situations that would generally jeopardize his standings in society. His ultimate goal would be to drive the other kit into hiding far away. 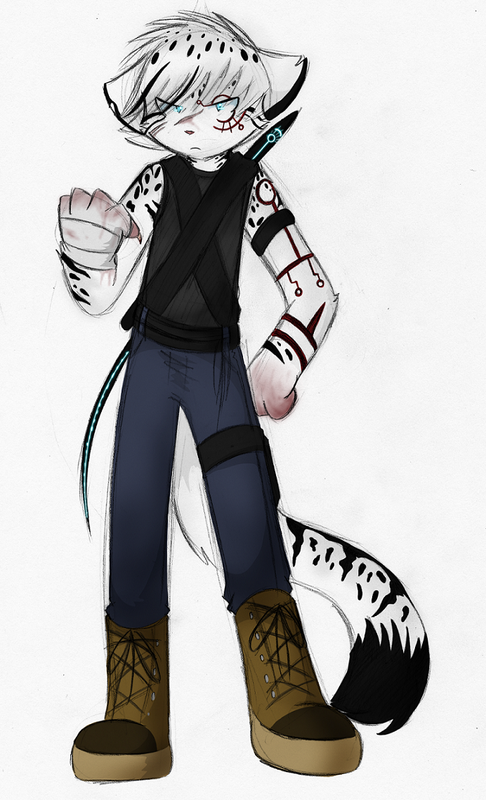 Ice is the older of Hailstone’s kits and unlike Glacier, both of his parents were in the same gang. It was fairly needless to state that when Hailstone ditched Ice’s mother for a cat from a different gang it did not settle well with him, even at his fairly young age. Ice grew angry with his father, but in particular the other cat and additionally her young kit whom had quickly become the speculation of both gangs. Ice never did mend relations with his father, even after the offending cat’s gang disintegrated and Hailstone’s loyalties seemed to exclusively return to their own gang. Ice set out to clear his own name as he had inherited the reputation of being untrustworthy thanks to his father. Although he has not easily achieved the status he has been increasingly successful over time. The cat’s methods are generally questionable at best and many of the more senior members consider him something of a rogue due to his disregard of much of what they say. Ice has particularly more violent methods than a large majority of the gang which is indeed saying something since the others are not known for their tolerance either. A faction of the gang tends to follow him more than they do the others—primarily the younger generation. On many occasions he has gotten himself in trouble with the higher ups for such reasons, but nothing beyond what he could handle. It is Ice’s primary goal to ruin Glacier’s life as best he can. Preferably permanently so that the kit will not be accepted anywhere he goes. Ice has been responsible for making slow but gradual progress towards that goal—in large part being responsible for why so many different foster homes have wanted nothing to do with Glacier within a few months. Now that he knows the younger kit is involved with the police forces, he intends only to amplify his efforts and ruin any sort of trust connection they currently have. He sees it only fair after all, being robbed of his own reputation by causes beyond his control. Although he could easily overpower the younger kit, he prefers to take a more sly and in his opinion, painful approach by drawing out his revenge and causing those around Glacier to turn against him. All the same, Ice still starts fights with Glacier from time to time, mostly just messing with him for a short while before departing of his own accord. The cat has drawn various symbols and marks associated with the gang he is a part of on his face and arm— a further, outright display of his association and loyalty to them. Ice always carries around what appears to be a type of whip that has glowing lining along it. He uses it to grab things more often than anything else, as it is lined with a few small hooks near the tip and furthermore has lining capable of heating up plenty to leave behind branded burn marks. He also has a normal whip, but he doesn’t always bring that along with him. Such a cute and adorable character! He has found a new home with me and I shall love him greatly!!! to be honest i am not sure yet, I'm kinda broke.... but i love @Dizzimor 's art. Maybe when I get my laptop fixed \, I could do it.... but what do you think?